A contemporary and friend of Mary Gage was Lillian H. Rosenblum Pines, who was born in 1894 in Manchester, NH. According to one Internet source, Pines graduated from Radcliffe College in 1915 and had a retail store in the Westbury Hotel on Madison Avenue in New York City. She died at the age of 100. Gage and Pines clearly influenced each other. Pines produced pins and bracelets. Several of her bracelets are below. 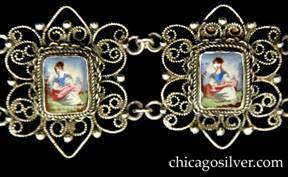 Bracelet, composed of six rectangular links each centering a rectangular bezel-set china transfer of a Victorian lady in a slightly different pose, surrounded by silver balls and extensive twisted wirework filigree ornament. 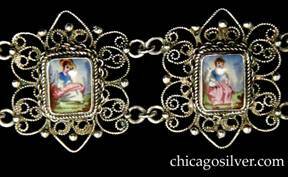 Elaborate clasp and safety chain. Bracelet, composed of five round floral links each centering a silver dome ringed with beads and six spirals that each end with a central bead. 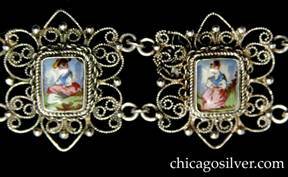 Bracelet, composed of five round links, each with six chased lily pads centering a bezel-set silver dome, with applied beads and vines on a round frame. Heavy. Bracelet, composed of six oval links each containing a mosaic pietra dura floral image surrounded by a beaded ring and flattened wire loops, with wire loops and silver bead at the ends. Links are joined by long flattened twisted wire. Very delicate.